Syria Solidarity UK and the Labour Campaign for International Development have today jointly called on the Shadow Foreign Secretary Emily Thornberry to clarify Labour’s position on the Assad regime. This follows her remarks in the Commons on Monday, seen in the video above, and in Hansard here. A PDF of our letter is here. We are writing to you, as campaigners for peace in Syria, to express our disappointment at your comments in the House, at the Oman, UAE and Iran debate on Monday 11 December 2017. In your question to the Foreign Secretary, you proposed a deal which would involve Iranian and allied forces, withdrawing from Syria in exchange for the withdrawal of coalition forces, the maintenance of Assad in power, and the provision of aid for reconstruction. Assad’s regime has been responsible for extensive and systematic crimes against humanity, and for the large majority of civilian deaths during the war. Any implication that Assad has a place in the future of Syria is therefore deeply harmful, as is any suggestion that the UK might fund the reconstruction of Syria under his rule. To allow Assad to continue in his position as President, after all the crimes he and his allies have committed, would be entirely opposed to the values of the Labour Party, which should always champion democracy, social justice and equality. The party should instinctively stand in solidarity with oppressed people; to further enable an oppressor would be damaging, not just for Syria, but for human rights worldwide. UN Security Council Resolution 2254 calls for UN-led talks — the Geneva process, not the Russian-led Astana talks — leading to elections. Free and fair elections are impossible as long as Assad holds as many as 200,000 Syrian citizens hostage in his prisons; and inconceivable as long as the Assad regime can prevent UN agencies from delivering even basic medical aid to civilians in besieged Eastern Ghouta in the suburbs of Damascus. Without legal accountability, any reconstruction funding will reinforce the criminality of the Syrian regime which led to this crisis. As long as a just and viable political solution is out of reach, the UK should support reconstruction only in ways which strengthen rather than undermine the legal rights of Syrians. This can only be possible in areas outside of the control of the Assad regime. 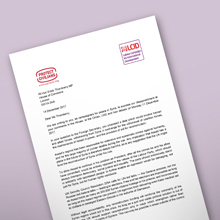 We ask that you please clarify Labour’s position on the Assad regime, and re-establish the party as one that actively condemns those responsible for mass murder and genocide and seeks to hold them accountable. To do otherwise would be to let down those living under the regime’s bombs.We look forward to hearing from you. Here is Emily Thornberry’s response. We would encourage readers to check her claim against what she actually said in Parliament. 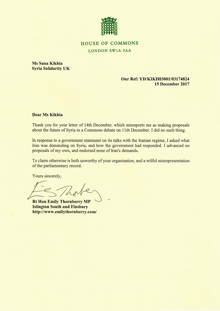 Thank you for your letter of 14th December, which misreports me as making proposals about the future of Syria in a Commons debate on 11th December. I did no such thing. In response to a government statement on its talks with the Iranian regime, I asked what Iran was demanding on Syria, and how the government had responded. I advanced no proposals of my own, and endorsed none of Iran’s demands. To claim otherwise is both unworthy of your organisation, and a wilful misinterpretation of the parliamentary record. Is Labour whistling Russia’s tune on Syria?